I am So glad you are drawing people, Andrea!! These are great! I love these! I think you're on to something...Post It People. 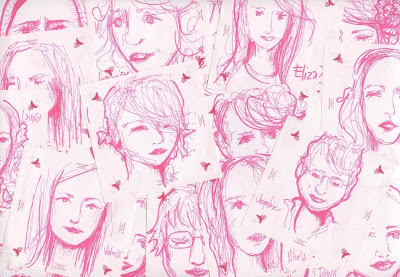 Love the idea of portraits on post-its! Very nicely done too. I too used to draw people all the time as a kid, and then I stopped. Now it's my greatest struggle, I never seem to get any likeness (that's probably why I stopped, unfortunately). I'm looking forward to seeing more of your portraits and people as I too have this as one of my goals for the year! How inventive and imaginative. You definitely have a gift with people. Look forward to seeing more of your work. These look so neat altogether. Hard to believe they are on simple post-it notes. I also loved the black shoe you did in ballpoint. I thought it was a photo until I read the post. Incredible what you can create with a ballpoint pen. 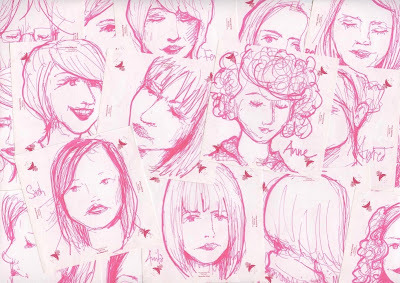 lovely drawings of people, definitely carry that one on! Post it poppets maybe? These are SO much fun and so expressive, Andrea! really good exercice, well done too. Nancy, I guess they are about 3x3inchs. I very much enjoyed this little project. I do quite a lot of this sort of stuff, just never post it (excuse the pun). I think I will share more from now. I feel a little exposed but I'm not sure that's a bad thing.